Wine Competitions — Should Wine Drinkers Care? The 2018 Winter Olympics in PyeongChang has wrapped up. However, the medals will be flowing all year long in the wine world. 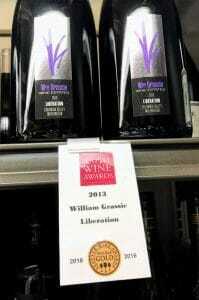 So far this year we’ve had the San Francisco Chronicle Wine Competition give out over 4000 gold, silver and bronzes. Meanwhile, the American Fine Wine Competition announced 14 pages worth of winners. Oh and the Winemaker Challenge International Wine Competition also gave out a hefty haul of hardware. And oodles and oodles and oodles more. There are so many competitions out there giving wineries boatloads of awards that I’m honestly surprised that Oprah has not gotten in on the action with her own wine competition. YOU get a medal! YOU get a medal! Everybody’s getting a MEDAAAAAAAAL!!! God knows how many medals the Tasters Guild International Wine Judging gives out. Unlike the Olympics where there is a finite amount of medals awarded for each event, wine competitions can give out virtually a limitless number–which stack the odds in a winery’s favor. In 2015, Victoria Moore of The Telegraph noted that of the nearly 16,000 wines entered in the Decanter World Wine Awards, around 70% won some kind of award. At the International Wine Competition (IWC) they gave out 490 golds, 2,110 silvers, 3,426 bronzes and 3,668 commended awards. For their 2012 event, W. Blake Gray of Palate Press highlighted that the San Francisco Chronicle Competition (one of the largest and most recognized wine competitions in the US) gave medals to more than 80% of the wines entered. Who benefits from all these competitions? Wine competitions are all about marketing for wineries. Paying a $55-175 entry fee per wine and sending in 4 to 6 bottles is pretty darn cheap economics if you happen to strike gold (pun intended). 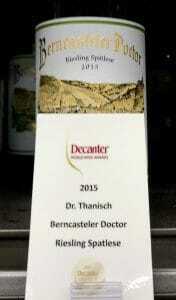 Even a lowly bronze medal has benefit for wineries. 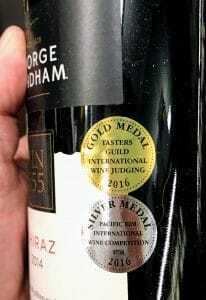 Granted, it mostly plays off the ignorance of wine consumers who assume that winning a bronze medal meant that the wine was the 3rd best out of thousands. Most folks don’t realize that a bronze often says that a wine was “not mortally flawed”–as Lenn Thompson of The Cork Report describes. In that same post, Thompson goes on to explain why he and his team no longer participate as judges for wine competitions. Plus, you can take that obscure award you won 7 years ago and use that sticker for everything. 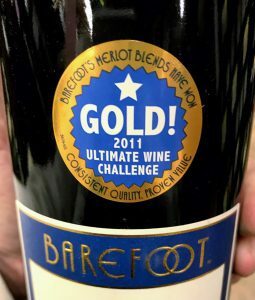 Think of how much mileage that Gallo has gotten off of touting the 2000 medals that their Barefoot brand has won from entering practically every wine competition in existence? It doesn’t matter if they were gold, silver, bronze or whatever. Likewise, Constellation Brands widely advertises their 50+ gold medals (from whom?) for their Black Box wines. Gallo and Constellation didn’t become multi-billion dollar companies by throwing away money. They know there is a benefit in flooding wine competitions with their wines. There is also a strong argument that the competitions themselves are the biggest beneficiaries–generating revenue from not only entry fees but also sponsorship & naming rights (for instance, the San Francisco Chronicle Competition is not run by the newspaper, they’re merely a sponsor), tickets to tastings featuring award winners and selling medal stickers to wineries. Is there any value for consumers? The shiny stickers are very pretty though. You have to start with acknowledging that, as Ronald Jackson notes in Wine Tasting: A Professional Handbook, the purpose of wine competition is to increase market awareness for wineries–to get your attention. They don’t exist for the benefit of giving you an unbiased and objective recommendation of what to drink. It’s okay to give them that attention and maybe even buy their wines to try. Just like with everything in life, you will never know how much you like something until you try it. If being curious about a medal winner is a reason for you to trade out your same ole, same ole for something new then go for it. But you should keep a few considerations in mind. Any post about wine competitions would be remiss without acknowledging the studies by Robert Hodgson into how inconsistent judging is at competitions and how seemingly random the results are. Wines that were gold medal winners in one flight of tasting were just as likely to be scored as bronze winners in the next flight by the same judges. Tasting wine is highly personal and extremely subjective. There are so many things that influence how we perceive a wine and whether or not it gives us pleasure from the ambiance of the room, the glassware, our mood that day, the wine we just had before, etc. Wine itself is also a moving target that not only changes in the bottle but changes in our glasses as well. Plus, just as some of us weren’t great “test takers” at school, some wines simply don’t show well being “tested” on their own and often need the context of food and social occasion to give pleasure. That is why you have to view wine awards (as well as critic scores) as only a single snapshot of how that wine tasted at that moment to that particular judge. Just like if your friend had this one great bottle of wine at dinner that you have to try, take a wine competition result with the same “your mileage may vary” caveat. While that wine may have been great for them at that one moment, that doesn’t mean it’s going to be great for you and your moment. A Platinum winner that was likely judged by at least 2-3 MWs and Master Sommeliers might be worth taking a look at. With no offense to Podunk State Fair, there is a bit more cache to having your wines judged by a panel of Masters of Wine and Master Sommeliers that competitions like the IWC, Decanter World Wine Awards, TexSomm and a few others regularly have. Even if MWs & MS are stacking the juries, there is still something noteworthy when you look at the lists of judges for competitions like San Francisco Chronicle Competition and Seattle Wine Awards and see acclaimed writers, sommeliers, educators and winemakers. Yes, these events still give out way too many medals. Yes, the judging of even highly trained professionals is still subject to vagaries. But if you are going to pay attention to the results of any competition, it’s worth having an idea of who was doing the judging. Be extremely skeptical of any competition that doesn’t have a published (and updated) list of who their judges were and their credentials. 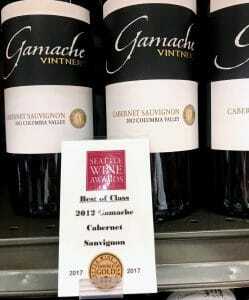 In the Seattle market, the high esteem of the judges and caliber of wines entered into the Seattle Wine Awards gives their Double Gold and Best of Class winners a fair amount of cache. Then you have “Sweepstakes Winners” and “Best in Show/Best of Class” that often require the wines going through another round of judging with different tasting panels. This is like a second snapshot taken. If a wine does well there, you know that it had to have impressed around a dozen or so people. The wine still might not be your personal style but the odds of a Double Gold/Sweepstakes winner from a reputable wine competition being “junk” is fairly low. 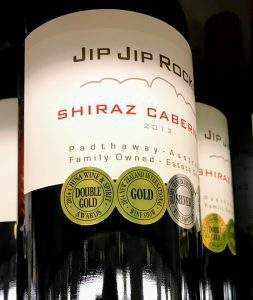 Don’t be afraid to try the highly touted “Award Winners” but still keep a healthy amount of skepticism–especially if someone is giving you a hard sell on their bronze medal winning wine from the Podunk State Fair. Tagged American Fine Wine Competition, Barefoot, Black Box, California State Fair Commercial Wine Competition, Concours Mondial de Bruxelles, Constellation Brands, Dan Berger, Decanter World Wine Awards, Finger Lakes International Wine Competition, Gallo, International Rose Championship, International Wine Challenge, International Women’s Wine Competition, Lenn Thompson, Los Angeles International Wine Competition, Master of Wine, Palate Press, Robert Hodgson, Ronald S. Jackson, San Francisco Chronicle Wine Competition, Sarah Jane Evans, Seattle Wine Awards, Sommelier Wine Awards, Tasters Guild International Wine Judging, TexSomm, The Cork Report, The Telegraph, Victoria Moore, W. Blake Gray, Wine competitions, Wine Tasting: A Professional Handbook, Winemaker Challenge International Wine Competition, WSET.